Movement Choir – Sitting on Benches (2012) was a continuation of the Movement Choir – Walk through public space. I was invited by the Berm organization to participate with Movement Choir in the group show they produce themselves. In front of Berm is a square (Krugerplein) and through observations of the square I built another performance and score. 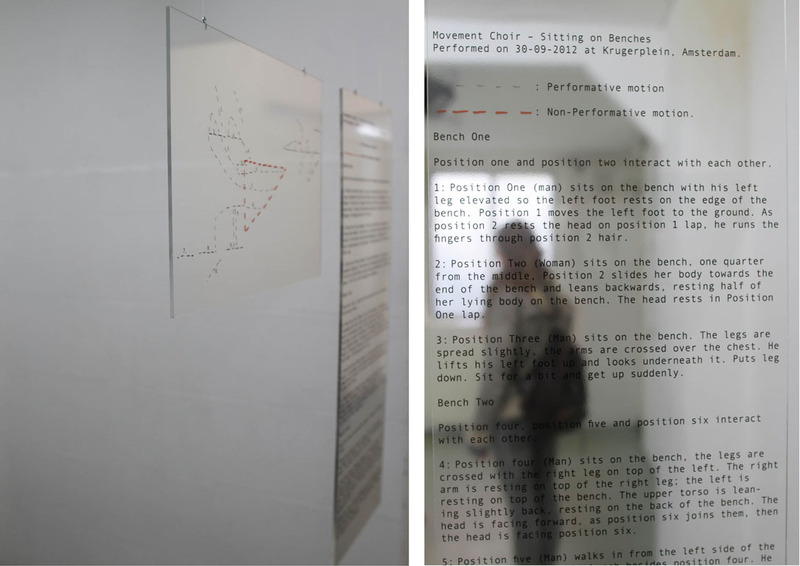 The score was printed on transparent folio and mounted on Plexiglas and hanged from wires in the room, which meant that the viewer could observe each other by looking through the score, making the text of the score a narrative of the other. Photo of installation of score. Material: Printed on transparent folio, Plexiglas.